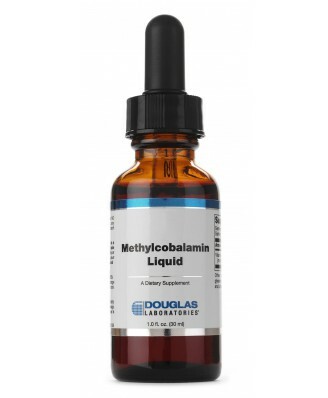 Methylcobalamin Liquid, provided by Douglas Laboratories®, provides 1,000 mcg of highly bioavailable vitamin B12 in a tasty and convenient liquid. Other Ingredients: Purified water, natural glycerin, natural cherry flavor, sodium benzoate, and citric acid. Vitamin B12 is essential for normal metabolism of carbohydrates, fat and protein. As a cofac tor for methylmalonyl - CoA mutase enzymes, vitamin B12 helps convert odd chain fatty acids and branched chain amino acids into succinyl - CoA, a common citric acid cycle intermediate. Vitamin B12 is also required for nucleic acid (DNA) synthesis, methionine synthesis from cysteine, and normal myelin synthesis in the nervous system. Along with vitamin B6 and folic acid, adequate levels of vitamin B12 are required to maintain normal plasma homocysteine levels. Certain populations, including the elderly, those with HIV/AIDS, and strict vegetarians are often at risk for vitamin B12 deficiency, either due to low dietary intake or impaired absorption. Most of the vitamin B12 found in supplements is in the form of cyanocobalamin. While cyanocobalamin is an excelle nt source of vitamin B12, studies indicate that methylcobalamin, a coenzyme form of B12, may be better utilized and better retained in the body. Other studies indicate that methylcobalamin itself may play important roles in supporting neurological and immu ne health. Methylcobalamin Liquid may be a useful nutritional adjunct for individuals who wish to increase their intake of vitamin B12. Adults take 1 dropper (1 ml) daily or as directed by physician. As a dietary supplement, take 1 dropper (1 ml) daily or as directed by your healthcare professional.